When putting together the NCAA Midwest Regional preview a couple weeks ago, it seemed fairly apparent (at least to me) that the team leaving South Bend, Ind., with a berth in this week’s Frozen Four wouldn’t be Nebraska Omaha. ECAC Hockey playoff champion Harvard, UNO’s first-round opponent, had won seven of its previous eight games. Minnesota State, the tournament’s top overall seed, won the WCHA regular-season and playoff titles and was arguably the nation’s most consistent team from day one. RIT, Minnesota State’s first-round foe, had won seven straight en route the Atlantic Hockey postseason crown. And then, in the immortal words of this guy, there’s Omaha. Three teams in South Bend had won two games the previous weekend. UNO had two wins in the previous seven weeks. The Mavs hadn’t posted consecutive victories since Jan. 17 (a 4-1 win at Colorado College) and Jan. 30 (an overtime win against visiting North Dakota) and hadn’t won twice in the same weekend since sweeping Denver in Omaha on Jan. 9-10. In the 11 games following the OT win against The Team That Shall Not Be Renamed, the Mavericks scored 20 goals. That was fewer than all but eight teams in the country. Then there’s this mind-scrambling statistic: during those 11 games, UNO scored nine even-strength goals. NINE! You know who had nine even-strength goals during that same span? Not RIT’s Brad McGowan—he had 13. Not Denver’s Trevor Moore or Harvard’s Jimmy Vesey—they each had 10. St. Cloud State’s David Morley and Miami’s Blake Coleman both had nine. That’s freaking absurd. And when I say freaking, I don’t mean freaking. There were signs the Mavs weren’t in complete disarray during that stretch. Led by senior goalie Ryan Massa (that’s him pictured above), UNO was only allowing 2.18 per goals game. The power play was clipping along at 24.3 percent success rate. And the absence of senior forward and team leader Dominic Zombo for all but one of those games certainly didn’t help. Zombo was back in the lineup for the Midwest Regional. More important, the Omaha that prompted “And then there’s Omaha …“ wasn’t this Omaha. Freshman Grant Gallo, who had one goal since Dec. 1, scored in the first period against Harvard. So did freshman Avery Peterson—he had zero points since Jan. 30. Another rookie, Tyler Vesel, added an empty-netter for his first goal since Jan. 30. In the third period of the regional final against RIT, freshman Jake Randolph gave UNO a 1-0 lead with his first goal since Dec. 30. Freshman David Pope, who had scored one goal since Jan. 9, added an ENG in what turned into a 4-0 romp. Massa—who in his first three years with the Mavs rarely saw his name without “up-and-down” or “inconsistent” in front of it—was named regional MVP, stopping 73 of the 74 shots he faced in South Bend. So now here’s Omaha … in its first Frozen Four. A lesser person would probably want a little credit or acknowledgment for spurring the Mavs—after all, one third of my tweet has appeared on a sign at the Midwest Regional, was turned into a t-shirt, and was mentioned by Zombo in a recent Omaha World-Herald article. However, I crave not these things. Just remember one thing about Nebraska Omaha: You didn’t hear it here first. Key Players: Matt Leitner, F, Sr., 39 GP, 9-23–41; Bryce Gervais, F, Jr., 39 GP, 27-9–36; Casey Nelson, D, So., 39 GP, 7-26–33; Stephon Williams, G, Jr., 34 GP, 25-5-3, 1.64 GAA, .926 save pct. What You Need To Know: The Mavericks were NCAA Division II hockey national champions in 1980, beating Elmira in the championship game. In 1979, Minnesota State (then known as Mankato State) finished second in the Division II tournament to Lowell (now UMass Lowell), which was led by future four-time Stanley Cup winner Craig MacTavish. Burning Question: Is this the Mavericks’ year? Minnesota State has been the nation’s most consistent team from the start and, on paper, they have no weaknesses. 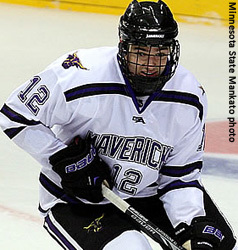 In fact, one could argue the Mavs enter the NCAA tournament playing their best hockey to date—since its March 6 loss at Bemidji State, Minnesota State has won five straight, outscoring its opponents by a 25-6 margin. They’re also ruthless once they take the lead; the Mavs are 20-1-3 when up after one period and 22-1-0 when leading after 40 minutes. Anything less than a Frozen Four trip would be a disappointment. 21-Chase Grant 23-Teddy Blueger 15-C.J. 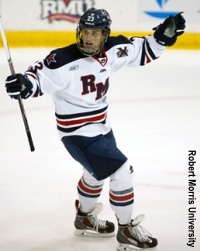 Franklin Defenseman Zach Palmquist will play his 160th consecutive game in a Maverick uniform Saturday vs. RIT. That’s the longest active consecutive games-played streak in the nation. Key Players: Jake Guentzel, F, So., 33 GP, 12-23–35; Austin Ortega, F, So., 36 GP, 19-15–34; Ian Brady, D, So., 35 GP, 5-15–20; Ryan Massa, G, Sr., 26 GP, 12-7-6, 2.04 GAA, .934 save pct. What You Need To Know: The Mavericks and Minnesota State are the only teams in this year’s field without a previous NCAA tournament win. UNO was ousted in the first round in both its prior national tournament berths; Minnesota State is winless in its three previous NCAA appearances. Burning Question: Will the Mavs’ late-season swoon carry over into the NCAA Tournament? Things were looking pretty rosy for Omaha after beating visiting North Dakota in overtime on Jan. 30 to improve to 16-6-3 overall and 10-4-1 in the NCHC. But the Mavs spun out thereafter, going 2-6-3 in its last 11 games. The primary problem? Scoring. Omaha has 20 goals in its last 11 games, and only nine of them have come at even strength. The lack of 5-on-5 offense doesn’t bode well for the Mavs in a region in which the other three teams are rolling. 12-David Pope 20-Jake Guentzel 16-Austin Ortega UNO’s freshmen have combined for 98 points to date this season. That’s second-most among NCAA tournament teams behind only Boston University’s 139 points. Key Players: Jimmy Vesey, F, Jr., 36 GP, 31-26–57; Kyle Criscuolo, F, Jr., 36 GP, 17-30–47; Patrick McNally, D, Sr., 20 GP, 6-15–21; Steve Michalek, G, Sr., 36 GP, 21-12-3, 2.29 GAA, .924 save pct. What You Need To Know: Seven ECAC Hockey schools won the league’s regular-season or playoff championship in the time between Harvard’s last ECAC Hockey crown (a league playoff title in 2006 and its league tournament triumph last weekend in Lake Placid, N.Y. Burning Question: Which Crimson team will show up: the one that won seven of its last eight games, the one that started the season 10-1-2, or the one that went 4-10-1 from Jan. 10-Feb. 27? This much is true: Jimmy Vesey will show up. The junior forward has been on an absolute tear over the last six games with 10 goals and 15 points. Even more encouraging is the recent play of goalie Steve Michalek, who has a 1.63 GAA and a .937 save percentage in the last month. The first-round date with struggling Omaha is quite favorable for Harvard. 19-Jimmy Vesey 14-Alex Kerfoot 11-Kyle Criscuolo Vesey opened the year with a 20-game point streak during which he scored 18 goals and added 16 assists. He’s only been held scoreless in three games this season—all losses. The Crimson scored a total of one goal in those matches. Key Players: Matt Garbowsky, F, Sr., 38 GP, 26-27–53; Josh Mitchell, F, Jr., 38 GP, 15-35–50; Brady Norrish, D, Fr., 37 GP, 4-18–22; Jordan Ruby, G, Sr., 21 GP, 10-7-4, 2.11 GAA, .923 save pct. What You Need To Know: The Tigers enter the tournament with a seven-game winning streak and eight wins in their last 10 games, both tops among teams in this year’s NCAA field. Burning Question: Can the Tigers recapture the magic that led to their 2010 Frozen Four appearance? Is it probable? No, but it’s possible. RIT bottomed out at 5-10-3 on Jan. 3 after losing to Minnesota in overtime at the Mariucci Classic. The Tigers are 14-4-2 since—only Minnesota State has more wins during that span—and Josh Mitchell, Matt Garbowsky, and Brad McGowan each have scored 30+ points during that stretch. The goaltending has been excellent, too; both Jordan Ruby and Mike Rotolo have sub-2.00 goals against averages since Jan. 9. 7-Brad McGowan 9-Matt Garbowsky 25-Josh Mitchell Brady Norrish’s 22 points is the most by an RIT freshman defenseman since current Vancouver Canucks blueliner Chris Tanev put up 28 points in his lone season with the Tigers in 2009-10. Norris has 10 points (all assists) in his last seven games. Key Players: Austin Czarnik, F, Sr., 39 GP, 9-34–43; Riley Barber, F, Jr., 38 GP, 20-20–40; Matthew Caito, D, Jr., 38 GP, 3-19–22; Jay Williams, G, Jr., 27 GP, 19-8-0, 1.89 GAA, .922 save pct. What You Need To Know: With forward Blake Coleman (20 goals) suspended for Saturday and the status of forward Riley Barber (20 goals) in doubt after he was injured late in last weekend’s NCHC championship game win vs. St. Cloud State, Miami could face Providence without 32 percent of its goal production. Burning Question: Seriously, how do the RedHawks get by Providence without Coleman and potentially Barber? In addition to sharing the team lead in goals, both have been on fire as of late. Coleman’s got eight goals and 13 points in his last six games; Barber’s got seven goals and 13 points in his last nine contests. Goals will be at a premium, especially against goalie Jon Gillies and the stingy Friars defense. It’ll be up to leading scorer Austin Czarnik to get others involved in the offense. 95-Anthony Louis 7-Austin Czarnik 22-Kevin Morris With 167 points in 158 games, Austin Czarnik is the tournament’s active scoring leader. He’s three points ahead of Minnesota’s Kyle Rau and five points in front of Minnesota State’s Matt Leitner. Key Players: Danton Heinen, F, Fr., 38 GP, 16-29–45; Trevor Moore, F, So., 37 GP, 21-21–42; Joey LaLeggia, D, Sr., 35 GP, 13-25–38; Tanner Jaillet, G, Fr., 25 GP, 14-7-0, 2.38 GAA, .917 save pct. What You Need To Know: The Pioneers eclipsed the 20-win plateau for the 14th straight season, the longest such streak in Division I hockey. North Dakota is second with 13 straight seasons of 20 wins or more. Burning Question: Are we paying enough attention to the Pioneers? This team has all the ingredients to win a national championship—its best players (Danton Heinen, Trevor Moore, and Joey LaLeggia) come into the NCAA tournament playing their best hockey, a strong veteran presence with seven seniors in the lineup, and a very good defensive unit paced by LaLeggia, junior Nolan Zajac, and sophomore Will Butcher. If Denver gets steady play from the goaltending tandem of Tanner Jaillet and Evan Cowley, it could earn a trip back to Boston, site of its 2004 national title triumph. 26-Evan Janssen 27-Quentin Shore 12-Ty Loney Forward Danton Heinen enters the weekend with 45 points, the most by a Pioneers freshman since Dave Shields scored 48 points in 1986-87. Key Players: Alex Tuch, F, Fr., 36 GP, 14-14–28; Adam Gilmour, F, So., 37 GP, 9-17–26; Teddy Doherty, D, Jr., 37 GP, 6-17–23; Thatcher Demko, G, Jr., 34 GP, 19-12-3, 2.14 GAA, .927 save pct. What You Need To Know: The Eagles and Denver, their first-round opponent, played a two-game series at Magness Arena Oct. 31-Nov. 1. The two teams split, each winning a 2-1 decision. Ryan Fitzgerald scored two goals in the BC win; Danton Heinen scored both Denver goals in the Pioneers’ overtime victory. Burning Question: Are the Eagles really going to rely on goaltending and defense? Boston College has scored 105 goals to date which, barring a national championship run, will be the team’s lowest output since its 96 goals in 1961-62. Fortunately, the Eagles can lean on goalie Thatcher Demko and the most talented defensive corps in college hockey, which includes one first-round NHL draft pick (Michael Matheson), two second-round selections (Ian McCoshen and Steve Santini), and a sure-fire first-rounder in the 2015 draft (Noah Hanifin). Goals may be at a premium for BC, but this year’s Eagles are built to win that way. 19-Ryan Fitzgerald 26-Austin Cangelosi 11-Chris Calnan Saturday’s game features two of the tournament’s highest-scoring defensive corps. BC’s blueliners have totaled 97 points this season (fifth among NCAA tourney teams); DU’s rearguards are tied for second with 111 points. Key Players: Nick Saracino, F, Jr., 36 GP, 13-20–33; Trevor Mingoia, F, Jr., 36 GP, 13-14–27; Tom Parisi, D, Jr., 35 GP, 3-13–16; Jon Gillies, G, Jr., 31 GP, 20-13-2, 1.95 GAA, .931 save pct. What You Need To Know: Providence is making back-to-back NCAA tournament appearances for the first time in school history. The Friars made three trips to the national tournament between 1981-1985, but had a year off between each berth. Burning Question: Can a baseball analogy work for the Friars? The strength of this Providence team is up the middle with goaltender Jon Gillies, one of the best in the country, and three very good centers in senior Ross Mauermann and juniors Noel Acciari and Mark Jankowski. And while they’re not explosive offensively, how many goals the Friars score is often secondary to when they score—Providence is 16-3-0 this season when it scores first. Taking a lead, holding on to it, and turning the game over to the closer in Gillies isn’t a bad strategy. 22-Brandon Tanev 24-Noel Acciari 18-Nick Saracino The Friars have scored a total of 17 goals in its 13 losses. Nine of Providence’s losses have been by one goal and four of them have come in overtime. Key Players: Drake Caggiula, F, Jr., 39 GP, 16-17–33; Michael Parks, F, Sr., 39 GP, 12-20–32; Jordan Schmaltz, D, Jr., 39 GP, 4-23–27; Zane McIntyre, G, Jr., 39 GP, 27-9-3, 2.05 GAA, .929 save pct. What You Need To Know: With two wins in Fargo this weekend, the criminally underappreciated Hakstol will take North Dakota to the Frozen Four for the seventh time in his 11 seasons as head coach. 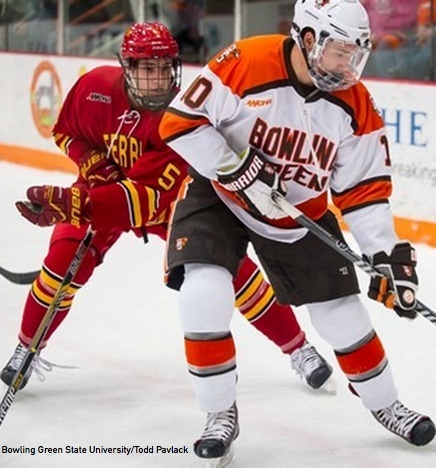 Burning Question: Was the NCHC Frozen Faceoff an aberration? North Dakota didn’t look particularly sharp in last weekend’s losses to St. Cloud State and Denver, but we’re inclined to give a mulligan to a team whose last back-to-back losses occurred in November 2013. North Dakota misses injured forward Mark MacMillan and his team-high 16 goals; still, this is a team that whose total is greater than the sum of its parts. A very good defensive corps, goaltender and Hobey Baker finalist Zane McIntyre, and rabid, decidedly pro-NoDak crowd in Fargo make the top seed the prohibitive favorite in the West. 9-Drake Caggiula 27-Luke Johnson 15-Michael Parks North Dakota hasn’t had its team scoring leader put up fewer than 39 points since the 1993-94 season, when Landon Wilson recorded 33 points for the WCHA’s last-place team. Key Players: Tanner Kero, F, Sr., 40 GP, 19-26–45; Alex Petan, F, Jr., 40 GP, 15-24–39; Shane Hanna, D, So., 40 GP, 6-14–20; Jamie Phillips, G, Jr., 40 GP, 28-8-2, 1.71 GAA, .935 save pct. What You Need To Know: American International, Army, Bentley, Connecticut, Dartmouth, Penn State, and Sacred Heart: They’re the only teams without an NCAA tournament appearance since the Huskies last received an invitation back in 1981. Michigan Tech coach Mel Pearson was a senior forward on that team. Burning Question: Are the Huskies just happy to be here? There’s likely a certain amount of relief among Keewenaw Peninsula hockey fans now that the NCAA tourney drought for the storied Tech program is over. That said, this is a really good team led by a terrific goaltender in junior Jamie Phillips and a talented group of forwards and there’s little doubt the Huskies would love exorcising a couple more demons by getting a chance to bounce former WCHA foes St. Cloud State and North Dakota from the field. 14-Malcolm Gould 19-Blake Pietila 7-Reid Sturos Four Huskies have eclipsed the 100-point plateau for their careers: senior forwards David Johnstone, Tanner Kero, and Blake Pietila and junior forward Alex Petan. Key Players: Joey Benik, F, Jr., 38 GP, 16-22–38; Jonny Brodzinski, F, Jr., 38 GP, 20-17–37; Ethan Prow, D, Jr., 33 GP, 4-18–22; Charlie Lindgren, G, So., 36 GP, 18-17-1, 2.26 GAA, .919 save pct. What You Need To Know: Keep an eye on the statuses of junior forward Kalle Kossila and senior defenseman Andrew Prochno. Neither played in last weekend’s NCHC Frozen Faceoff in Minneapolis due to injury. Burning Question: How far can Charlie Lindgren take them? St. Cloud State played their way into the NCAA tournament by winning 10 of their last 16 games, during which the sophomore goaltender posted a 1.81 goals against average and a .933 save percentage. This edition of the Huskies isn’t as high scoring as those we’ve seen in the past; the potential absence of Prochno, SCSU’s best defenseman, puts even more of the burden on Lindgren. 9-Joey Benik 13-David Morley 63-Patrick Russell The only player in this year’s NCAA tournament with more career goals than Jonny Brodzinski’s 63 is Minnesota’s Kyle Rau, who has 67. Rau, a senior, has played in 159 games while Brodzinski, a junior, has played in 118 games. Key Players: Sam Anas, F, So., 37 GP, 23-16–39; Matthew Peca, F, Sr., 38 GP, 7-29–36; Justin Agosta, D, Sr., 38 GP, 3-19–22; Michael Gartieg, G, Jr., 35 GP, 22-9-3, 2.00 GAA, .918 save pct. What You Need To Know: The Bobcats’ senior class enters the NCAA tournament with 97 career wins. Only Minnesota (105), Boston College (104), and North Dakota (100) have more victories during that same span. Burning Question: Can Quinnipiac survive the loss of sophomore forward Sam Anas? The Bobcats’ leader in goals (23) and points (39) suffered a leg injury in the deciding game of his team’s ECAC Hockey quarterfinal series win over Union; he didn’t dress for Quinnpiac’s loss to Harvard in last weekend’s league tournament semifinals and isn’t expected to play in Fargo. Anas had a strong second half —he registered 13 goals in his last 17 games and seven goals in the five games before he was hurt. 18-Sore Jonzzon 20-Matthew Peca 16-Landon Smith Quinnipiac’s roster boasts three sets of brothers: Connor and Tim Clifton, Bo and Canon Pieper, and twins Jonah and Nathan Renouf. Key Players: Jack Eichel, F, Fr., 36 GP, 24-42–66; Evan Rodrigues, F, Sr., 37 GP, 18-39–57; Matt Grzelcyk, D, Jr., 37 GP, 10-26–36; Matt O’Connor, G, Jr., 31 GP, 22-3-4, 2.12 GAA, .928 save pct. What You Need To Know: Since winning the school’s fifth national title in 2009, the Terriers have made just one NCAA tournament appearance. That was in 2012, when BU was bounced by Minnesota in the first round of the West Regional. Burning Question: Can anyone stop Jack Eichel? The nation’s leading scorer averages 1.83 points per game and, remarkably, he’s been racking up points at an even better clip as the season has progressed—witness his 39 points in 20 games in 2015 and 26 points during his current 12-game scoring streak. But he’s managed just six points (all assists) in BU’s seven losses. Sure, the Terriers have dangerous players throughout the lineup—last year’s leading scorer, Robbie Baillargeon, is a third-line wing this season—but if you can’t corral Eichel, you can’t beat BU. 17-Evan Rodrigues 9-Jack Eichel 10-Danny O’Regan Further evidence of the Eichel Effect: Terriers forward Evan Rodrigues entered his senior year with 60 career points in 105 career games. He’s got 57 points in 37 games this season as Eichel’s linemate. Key Players: Tony Cameranesi, F, Jr., 38 GP, 8-20–28; Dominic Toninato, F, So., 32 GP, 16-9–25; Andy Welinski, D, Jr., 38 GP, 9-11–20; Kasimir Kaskisuo, G, Fr., 34 GP, 17-13-3, 2.31 GAA, .915 save pct. What You Need To Know: The Bulldogs were 18-10-1, their high-water mark of the season, after beating St. 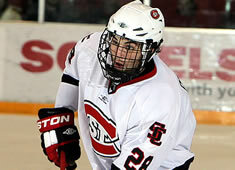 Cloud State in Duluth on Feb. 13, then proceeded to go 2-5-2 the rest of the way. Burning Question: Can UMD score enough goals? The Bulldogs have averaged just 2.0 goals per game during their recent 2-5-2 stretch; since Valentine’s Day, the team ranks tied for 42nd in the country in scoring offense. In the 29 games prior to Valentine’s Day, UMD had the nation’s 13th best scoring offense, averaging 3.14 goals per game. A return to form for forward Dominic Toninato, the team’s best player who has struggled since missing five February games with an injury, would boost the Bulldogs’ fortunes. Note: Tip of the hat to all the UMD fans who pointed out that sophomore forward Alex Iafallo, the team’s third-leading scorer who hasn’t played in more than a month due to illness, is expected to be back on the Bulldogs’ top line Friday. 8-Kyle Osterberg 19-Dominic Toninato 26-Adam Krause First-round foes UMD and Minnesota have played four games at four different sites this season: Notre Dame, Ind., in the Ice Breaker; Minneapolis; Duluth; and St. Paul, Minn., in the North Star College Cup. Key Players: Mike Reilly, D, Jr., 38 GP, 6-36–42; Kyle Rau, F, Sr., 38 GP, 20-21–41; Travis Boyd, F, Sr., 31 GP, 19-21–40; Adam Wilcox, G, Jr., 37 GP, 22-11-3, 2.38 GAA, .913 save pct. What You Need To Know: The Gophers recovered from a 4-8-2 skid between Nov. 14 and Jan. 24 to post a 12-3-1 mark over its last 16 games. Burning Question: Can the Gophs keep on keepin’ on? During its recent 16-game run that started with a Jan. 30 win at Wisconsin, Minnesota has averaged 4.06 goals per game, attempted an average of six more shots per game than its foes, has won more than 55 percent of its faceoff, and boasts a ridiculous power-play success rate of 32.1 percent. Figuring out the key to the Gophers’ success is almost too easy—they’re really, really good when they control the puck and, when they don’t, they’re not good. 18-Leon Bristedt 7-Kyle Rau 24-Hudson Fasching With a team-high 42 points in 38 games, Mike Reilly has a chance to become the first defenseman to lead the Gophers in scoring since Mike Crowley in 1996-97. Key Players: Frankie DiChiara, F, So., 32 GP, 8-13–21; Rob O’Gara, D, Jr., 32 GP, 6-15–21; Mike Doherty, F, So., 32 GP, 12-8–20; Alex Lyon, G, So., 31 GP, 17-9-5, 1.58 GAA, .939 save pct. What You Need To Know: Sophomore forward Frankie DiChiara and junior defenseman Rob O’Gara share the team lead in scoring with 21 points. If one ranked all the players in this year’s NCAA tournament by points, DiChiara and O’Gara would be tied for 87th on that list. Burning Question: Is there any possible way the Bulldogs can get past Boston University? No disrespect to Yale—and, yes, that improbable run to the 2013 national championship is still fresh in everyone’s minds—but this is a terrible matchup for them on paper. The Bulldogs were winless in the eight games this season in which they allow more than two goals and haven’t won when the opponent scores first. Any chance of an upset starts (and likely ends) with goaltender Alex Lyon, the country’s leader in goals against average, save percentage, and shutouts (seven). 17-Frankie DiChiara 9-Carson Cooper 12-Cody Learned The Bulldogs have given up an NCAA-low 51 goals this season, and its nine power-play goals allowed is also tops in the country in that category. Equal parts desire and boredom compelled me to whip up the at-a-glanciest of previews for this weekend’s conference tournament action. Even if you disagree with everything written below, do me one favor: push the math majors to the side for a couple days and just enjoy what’s taking place on the ice. Life is for the living! Who should win: Robert Morris. Though the Colonials, Canisius, and RIT have been on roughly the same arc since launching into league play in early January—all three teams have 12 wins since Jan. 9—Robert Morris has been the most consistent from day one. Who will win: Robert Morris. Coach Derek Schooley’s team, led by Hobey Baker Award finalist Cody Wydo (pictured, right), ranked first in Atlantic Hockey in scoring offense, third in scoring defense, first in power-play success, and second in penalty killing. The Colonials will get past RIT and the Tigers’ terrific forward Matt Garbowsky, another Hobey finalist, in the title match en route to a second NCAA Tournament berth in as many seasons. Who should win: Minnesota. Unlike the rest of the Big Ten, the Gophers’ flaws appear to be primarily mental. Provided they show up in Detroit with the proper frame of mind, they’re the league’s most-balanced team. Who will win: Minnesota. Whom do you trust to win two or three games in a row? Michigan might score seven goals one night, then allow seven the next. Michigan State goalie Jake Hildebrand was named B1G POY earlier this week but, in spite of his brilliance, the Spartans are 6-13-2 when allowing two or more goals. Think about that—in games in which its opponents put up a crooked number, MSU has a .333 winning percentage. That’s absurd. Do you like Spartans’ chances of keeping Michigan and (likely) Minnesota to zero or one goals on consecutive nights? Neither do I. Who should win: I … don’t …know. One can make a compelling case for each of the four teams. Quinnipiac, which pretty much coasted to the league’s regular-season title, has the best balance. St. Lawrence, led by freshman netminder Kyle Hanlon’s 1.66 GAA and .947 save percentage over the Saints’ last 15 games—SLU was 11-3-1 during that span—has the best goaltender. Colgate, unbeaten in its last seven games and 7-2-1 since Feb. 1, is peaking at the right time. Then there’s Harvard, which brings the most talent to Lake Placid. Who will win: Colgate. Logic would most likely dictate Quinnipiac in this spot, I suppose, but the Raiders enter the weekend on a bit of a roll—not as hot as they were a year ago when an extraordinary second half propelled them to an ECAC Hockey championship game appearance and an NCAA Tournament bid, but pretty good nonetheless. We’re rolling the dice on the ‘gate. Who should win: Boston University. Take a look at the Terriers’ roster beyond Jack Eichel (pictured, right). A ton of talent and a good deal of experience would seem to be enough to allow BU to forge ahead, especially with probable NCAA Tournament teams Boston College and Providence bounced during last weekend’s quarterfinals. Who will win: Boston University. UMass Lowell, the defending league postseason champion and the best bet to challenge the Terriers this weekend, pulled out of a month-long mid-winter skid to go 4-1-3 in its last seven games. The River Hawks have one of the nation’s highest-scoring offenses and a solid goalie in Kevin Boyle; BU has the country’s most prolific offense and a better goalie in Matt O’Connor. Plus, you know, Jack Eichel. Who should win: North Dakota. You’d expect the nation’s top-ranked team to come into this weekend with a chip on its collective shoulder after entering this tournament a year ago as a massive favorite only to flop in the semifinals against a sub-.500 Miami team. Who will win: North Dakota. It won’t be easy—any time NoDak and St. Cloud State play it’s going to be a war, and Denver and Miami are both very good. But the hunch here is NoDak gets past the Huskies, who could be without key players Andrew Prochno (hand) and Kalle Kossila (upper body). Have to believe the winner of the Denver-Miami game (which, on paper, looks like the weekend’s best regardless of league) enters the the title match with less in its tank than North Dakota; that, plus goaltender Zane McIntyre, should be just enough to give NoDak the edge. Who should win: Minnesota State. If North Dakota is the country’s most consistent team, the Mavericks are second on that list. Coach Mike Hastings’ squad is ridiculously deep, too; senior forward Jean-Paul Lafontaine (pictured, right), who enters the weekend with 127 points in 154 career games, ranks seventh on the team in scoring this season with 24 points in 33 games. Who will win: Minnesota State. Picking top seeds to win five of the six league titles. Way to go out on a limb. Seriously, however, the Mavericks are, in this writer’s opinion, the nation’s best team. Ferris State and goalie C.J. Motte can be a dangerous semifinal matchup, but the Bulldogs won’t score enough to topple the Mavs. Michigan Tech is the sentimental favorite and, hey, they’re really good, too, with a 13-2-1 mark since Jan. 16, but the Mavericks—with all that scoring balance and stellar goaltending from Stephon Williams—are too good to be denied. @INCH true or false….CCHA in some form will return in the next 5 years? It’s a legitimate question, one that couldn’t be adequately answered in 140 characters. I may not do much better using 20 times the characters here, but it’s worth a shot. Even though we went through an entire round of realignment two years ago, programs that made a flip have a better idea how the current situation works for them. And I believe that, yes, the CCHA will come back in some form. It’s not that anyone is truly unhappy where they are right now. * But there’s going to a team or teams who think they can improve their situations by breaking away or, in the case of the CCHA, re-starting a league. * Look, I’ve heard the rumblings about Notre Dame not being keen on Hockey East for a variety of reasons, but they’re a better institutional fit in Hockey East—that’s a big deal at Notre Dame—and they’ll draw better crowds against HEA foes than they would against opponents from, say, the NCHC. If that happened, wouldn’t it make sense for nearby Ferris State to come on board? And might Atlantic Hockey members Canisius, Mercyhurst, Niagara and/or Robert Morris be open to flipping to a new-look CCHA, lured by the opportunity to offer 18 scholarships as opposed to the 14-scholarship limit imposed by their current league?Bowling Green owns the rights to the CCHA—at least that’s my understanding, and I don’t really know what that entails. That said, is it far-fetched to think Bowling Green, which according to this CBSSports.com story from last November has an athletic department deficit of $11.4 million, wouldn’t explore rejuvenating the CCHA as a way to cut costs? Do you think Western Michigan, which the same article says has a $21.3 million athletic department shortfall, could be convinced to join based on finances? That’s seven programs right there, enough for this imaginary league to get its playoff champion an automatic NCAA tournament bid. Getting to eight is easy, either by courting Lake Superior State or Miami. Ah, the RedHawks, the wild card in this scenario. They’re one of the top dozen hockey programs in the country; getting them to commit a new CCHA would be a coup. Would Miami, owners of a $19.7 million athletic department deficit according to CBSSports.com, join fellow MAC members Bowling Green and Western Michigan in a new league? Or do the RedHawks think leaving the powerful NCHC would be a disservice to the hockey program? For that matter, does Western Michigan feel the same way about a move out of Natty Ice? Arizona State joins the college hockey mix in a couple of years. Where will the Sun Devils land and, if they end up in the NCHC, does it open the door for, say, Minnesota State as that league’s tenth member? Now that the Big Ten has added Johns Hopkins as an affiliate member for men’s lacrosse, maybe that cracks the door for that league to go outside of its boundaries in search of more teams. This is all just speculation, but the hunch here is conference realignment in the next couple years is more than just possibility, but a probability. Key Players: Kyle Rau, F, Jr., 37 GP, 12-22–34; Sam Warning, F, Jr., 35 GP, 12-19–32; Mike Reilly, D, So., 37 GP, 8-21–29; Adam Wilcox, G, So., 34 GP, 23-5-6, 1.91 GAA, .933 save pct. What You Need To Know: The top overall seed in the tournament is also one of the youngest teams in this year’s field. The average age of the Golden Gophers’ roster is 21.17 years; only Boston College (average age: 20.65 years) is younger. Burning Question: Can Minnesota handle the scrutiny they’ll face in the wake of last year’s disappointing loss to Yale in the opening round of the 2013 NCAA Tournament? Getting to the regional final probably won’t be enough to satisfy Gopher fans. Minnesota is really good, but they’re also really young. The NCAA Tournament is a pressure cooker; playing in your backyard in front of thousands of your own fans expecting nothing less than a trip to the Frozen Four ratchets up that pressure. 26-Nate Condon 25-Justin Kloos 13-Taylor Cammarata Freshmen have accounted for 51 of the Golden Gophers’ 126 goals (40.5%) this season. No team in the country has received more offensive production from its crop of newcomers. Key Players: T.J. Tynan, F, Sr., 39 GP, 8-29–37; Vince Hinostroza, F, Fr., 33 GP, 8-24–32; Stephen Johns, D, Sr., 39 GP, 8-12–20; Steven Summerhays, G, Sr., 37 GP, 21-13-2, 2.00 GAA, .925 save pct. What You Need To Know: Notre Dame has just four power-play goals in 28 man-advantage opportunities over its last nine games for a 14.3 percent success rate, and the Irish have given up at least one power-play goal in six straight games. Burning Question: You pretty much know what you’re going to get from Steven Summerhays, but will the Irish get enough goals for him? Notre Dame has scored a total of 21 goals in its 14 losses this season. Regardless of how good your goalie is–and Summerhays has been All-American good this season–averaging 1.5 goals per game in your losses isn’t leaving much margin for error. 12-Sam Herr 18-T.J. Tynan 21-Bryan Rust In 21 games since Jan. 1, the Herr-Tynan-Rust line has combined to score 22 goals and 33 assists. Key Players: Nic Dowd, F, Sr., 36 GP, 21-18–39; Jonny Brodzinski, F, So., 36 GP, 20-19–39; Kevin Gravel, D, Sr., 36 GP, 10-13–23; Ryan Faragher, G, Jr., 33 GP, 19-8-4, 2.76 GAA, .906 save pct. What You Need To Know: Despite losing 2013 Hobey Baker Award winner Drew LeBlanc and high-scoring forward Ben Hanowski, the Huskies have 132 goals through 36 games this season. That’s 13 more than SCSU scored through 36 games last season. Burning Question: Which Ryan Faragher will show up? Will it be the one who started the year with a 10-1-1 mark, a 1.91 GAA, and a .927 save percentage? Or will it be the one who’s allowing nearly 3.3 goals per game while stopping less than 90 percent of the shots he’s faced since mid-December? Notre Dame’s offense has improved significantly over the last month, so we’ll likely know the answer soon. 16-Jimmy Murphy 26-Nic Dowd 13-David Morley How do you keep your penalty-killing unit, the eighth-worst in the country, from getting exposed? By taking an average of 8.2 penalty minutes per game, the fourth-fewest in the nation. Key Players: Cody Wydo, F, Jr., 41 GP, 30-22–52; Zac Lynch, F, So., 41 GP, 18-27–45; Tyson Wilson, D, Jr., 40 GP, 3-16–19; Dalton Izyk, G, Fr., 10 GP, 5-1-0, 2.73 GAA, .922 save pct. What You Need To Know: The Colonials are one of two teams in this year’s NCAA Tournament whose roster doesn’t feature at least one NHL draft pick. Ferris State is the other. Burning Question: How does Robert Morris pull off an upset of Minnesota? As we saw in Grand Rapids last year and Grand Forks in 2006, it can happen. And while it’s unlikely to occur at the X this time around, all bets are off if newly christened starting goalie Dalton Izyk stays hot and the Colonials jump out to an early lead, causing a pro-Golden Gopher contingent in St. Paul to become restless. 23-Cody Wydo 19-Scott Jacklin 27-Zac Lynch Wydo, the team’s leading scorer, has at least one point in 16 of his team’s last 18 games. During that stretch, he’s scored 15 goals and 29 points.